When we started planning our first trip to Europe several years ago, we wanted to see it all! I had visited Europe once before, in college, but Grant had not (unless you count a 30-minute layover while he was in the Army, which we don’t). We knew we wanted to make the most of the long flight and spend as much time there as we could. Our thoughts wandered to France, Germany, Italy and everywhere in between and near and far! After much consideration, we decided to just focus on Italy. We knew we would enjoy the trip more if we had time to see some of the smaller towns. We absolutely made the best decision in this regard and that idea has shaped much of our travels since then. 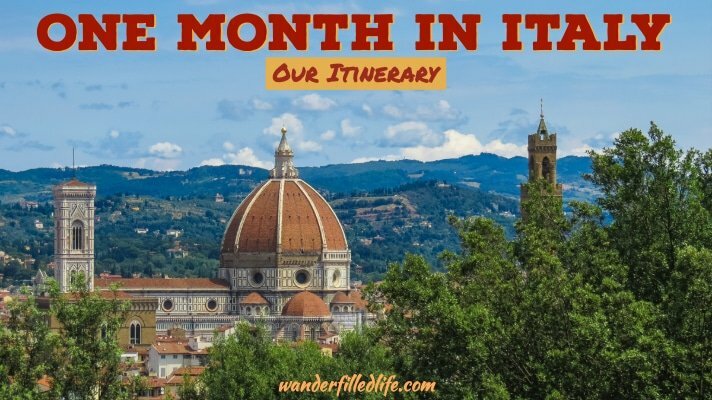 Here is our itinerary for how we spent one month in Italy, complete with our favorite sites and mistakes! 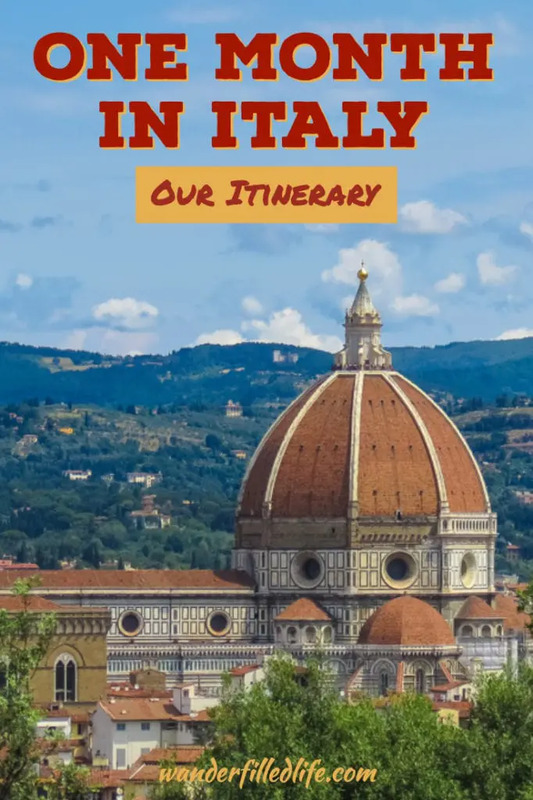 We used Rick Steve’s Italy itinerary for inspiration, but definitely made changes to make it work for us and our length of time. 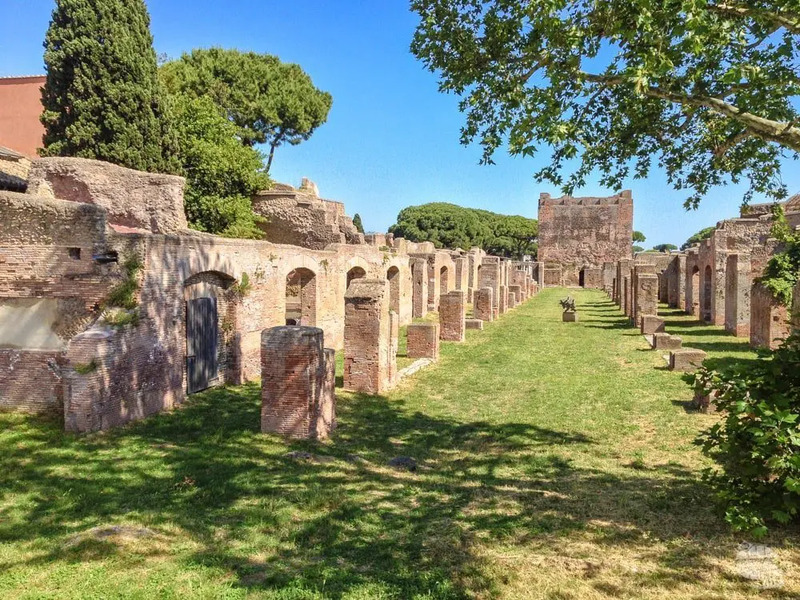 The ruins of Ostia Antica are beautiful and far less crowded than you will find in Rome. Most folks traveling to Italy will fly into Rome because it is the biggest city and a must-see destination. Rome is a good starting place, but it is very crowded and busy in the summer, so be ready! Our Four Days in Rome gave us enough time to see the major sites plus a few off-the-beaten-path sites. We decided to spend our first night at the Hilton at the airport (Fiumicino). In hindsight, that probably was not the best idea, especially since we arrived early in the day. We did end up going into the city, which was about a 30-45 minute shuttle bus or train ride. While we enjoyed the hotel and the amenities of the Hilton, I would only suggest staying near the airport if you are arriving later in the day and know that you won’t have time to go into the city. We booked our next three nights through AirBnB, which was our first experience with that app. Our room was in the apartment of some locals – a woman and her son. The location was great and the price was right. 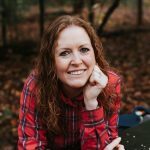 While everything was ok, it just was not the type of experience we were looking for – not enough privacy when staying in someone’s home vs. an actual bed and breakfast. Two or three days is enough time to see the major sites of Rome, such as the Colosseum, Vatican and the Spanish Steps. If you spend another day or two in Rome, it will give you time to get off the beaten path. 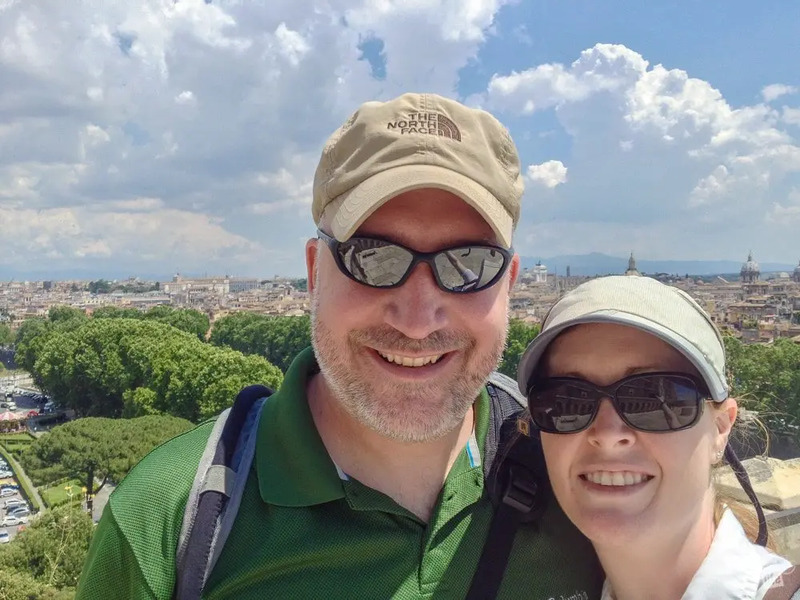 We found some of our favorite sites, such as the Catacombs of San Sebastian, Via Appia Antica and the Castel Sant’Angelo off the beaten path. From Rome we went to the Amalfi Coast. We chose to stay in Salerno at the wonderful Alto Mare B&B. The view from our room was amazing and the hosts were very friendly and helpful. Salerno itself is fairly quiet and there is not a lot to see or do. We enjoyed a big park near the coast, but the real attraction is the other nearby cities. We spent one day visiting Amalfi and Sorrento via ferry and bus. The next day we hiked “Sentiero degli Dei,” which means The Path of the Gods, near Amalfi. Get more details on our time at the Amalfi Coast, Salerno and Sorrento here. We spent one night in Naples, which was one night too many for us. Seriously, we absolutely HATED Naples. I had read some mixed reviews, so we were hesitant to add it as a stop. That said, the Archeological Museum in Naples houses many of the artifacts from Pompei, which we wanted to see. It was also a good base for visiting Pompei, which we really enjoyed. 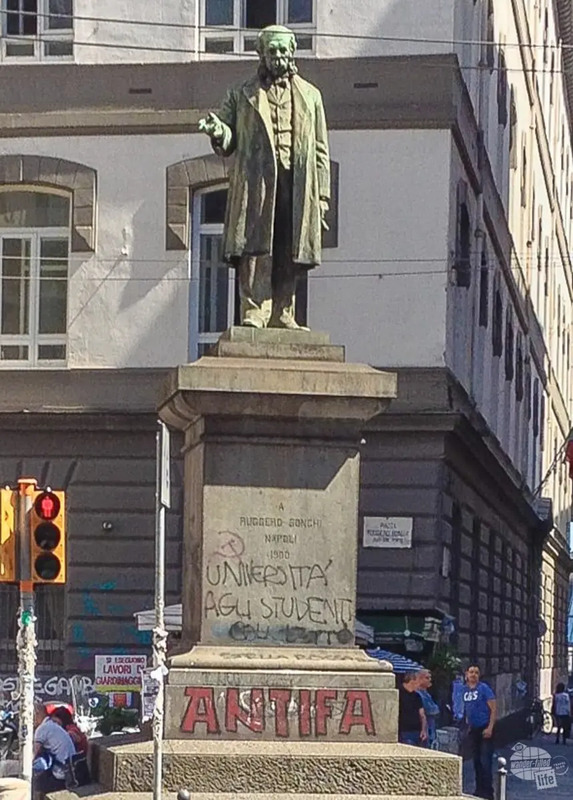 While you find graffiti everywhere in Italy, you don’t typically find monuments defaced. Not in Naples. Naples was dirty, crowded, confusing to navigate and not terribly safe. We definitely walked past a SWAT raid of some sort and are pretty sure we walked past a drug deal on one of the side roads (we were about a block off the main street trying to avoid the congestion). The food was not any different from anywhere else in Italy. I’m sure plenty of people have had wonderful experiences in Naples, but not us. On the flip side, our hotel in Naples, Hotel Piazza Bellini, was one of the best we stayed at the entire month in Italy. If you feel that you must go to Naples, we strongly suggest this hotel. We also started using the Booking.com app, rather than AirBnb. 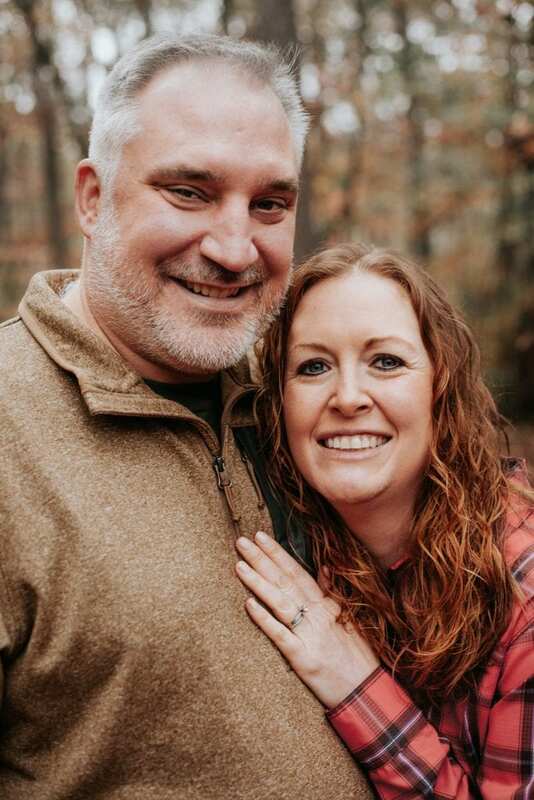 We like Booking better because it brings up not just the Bed & Breakfasts, but also local hotels, hostels, and even chains, such as Best Western or Hilton. This app became our main method for making hotel reservations, as it is very easy to use and has great listings. While we enjoyed the (overnight) ferry, which was basically a small cruise ship, we definitely made some mistakes here. One mistake was not scheduling more time for Sicily. The other was that we took the ferry from Naples to Palermo, but then decided to visit Mt. Etna on the other side of the island. We had to take a three-hour bus to get there and back. The upside was that we got to see a lot of the interior, which was very pretty. The downside was that we wasted a good part of our time there sitting on a bus. The Best Western Hotel Mediterraneo in Catania (one night) was very nice. They helped us book a tour of Mt. 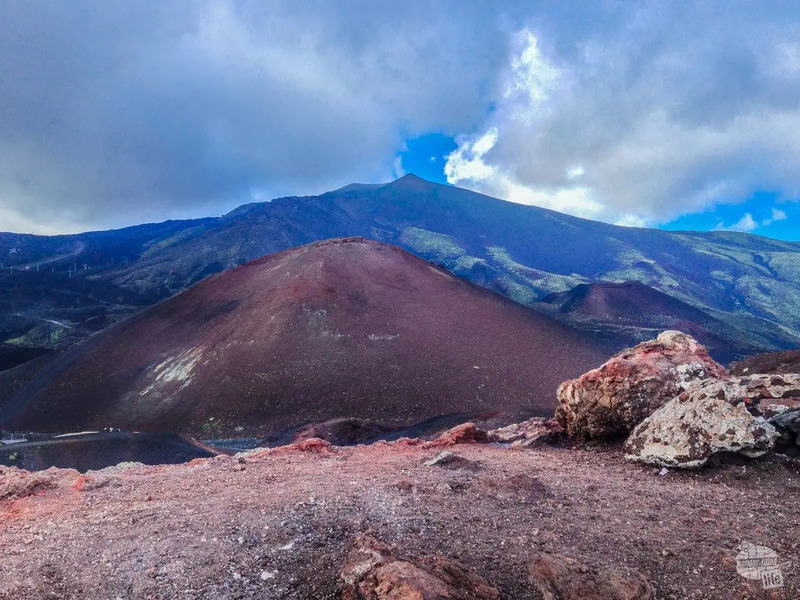 Etna, which was with a local guide and only four of us total in the group. We also found some great food here. If you want to try exotic meats, Sicily is the place to do it. Read more about our time in Naples, Pompei and Sicily here. We flew from Palermo to Venice on Ryan Air, which was a cheap and easy flight. One note about flying into Venice: there are two airports. Somehow, we weren’t paying attention and didn’t realize we were at the one farther outside the city. We kept waiting and waiting for the hotel shuttle to pick us up and couldn’t figure out why it was taking so long. Once we realized that we were at the “wrong” airport, it took a train and a cab to get us to the right place. I think we finally arrived after midnight…A full day of travel exhausted us! One of our biggest travel mistakes was flying to the wrong airpot in Venice, Italy. I think we were both responsible for that one. One full day in Venice was more than enough for us. Other people will tell you to spend two or three days or more. I think we were just tired that day and didn’t have the patience for some of the lines and rules about not taking bags into places. The city is very interesting though, and definitely worth a day or two. Make sure you take the time and spend the money for a gondola ride. On our second trip, we took one and LOVED it! We also recommend going out to the islands and seeing glass blowing… Amazing! Our hotel for this stay was the Hilton Garden Inn in Mestre, just outside of Venice. A note on Venice: you cannot drive in Venice, so don’t bother renting a car here. Honestly, though, I wouldn’t want to drive anywhere near any of the big cities in Italy. 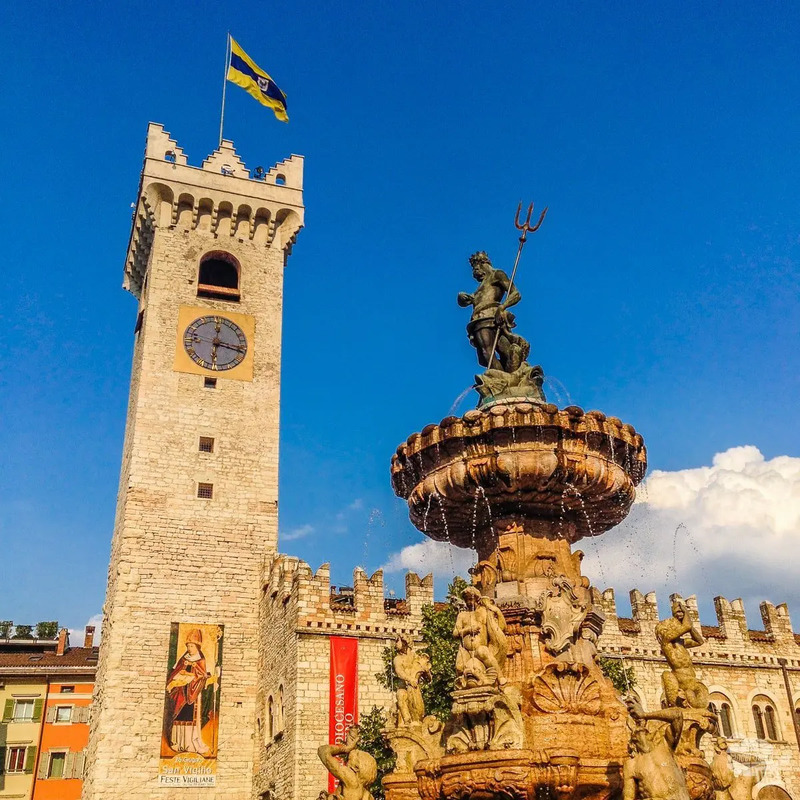 Trento is northwest of Venice and is a good base for visiting the Dolomite mountains in northern Italy. There is definitely a German/Austrian influence here and not nearly as touristy, which was a nice change of pace! We took a “hike” that offered some nice views, but we must have missed some signs because a lot of it was along a road. 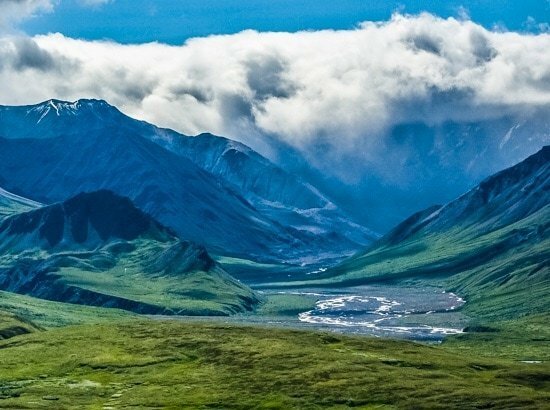 This was a great place to rest and relax, but maybe not necessarily a “must see” stop, unless you are just looking for something different. We stayed at the Hotel America, which was definitely more European than American! We were going to go from Trento to Bolzano, another mountain town farther north, but we discovered at the last-minute the museum we wanted to visit was closed the day we would be there. So, change of plans and directly to Milan we went. Milan was the perfect example of “don’t go somewhere just because everyone says you should go.” Yes, the cathedral in Milan was amazing. That was it. We aren’t big shoppers and didn’t care about going to any of the malls for the latest fashions. 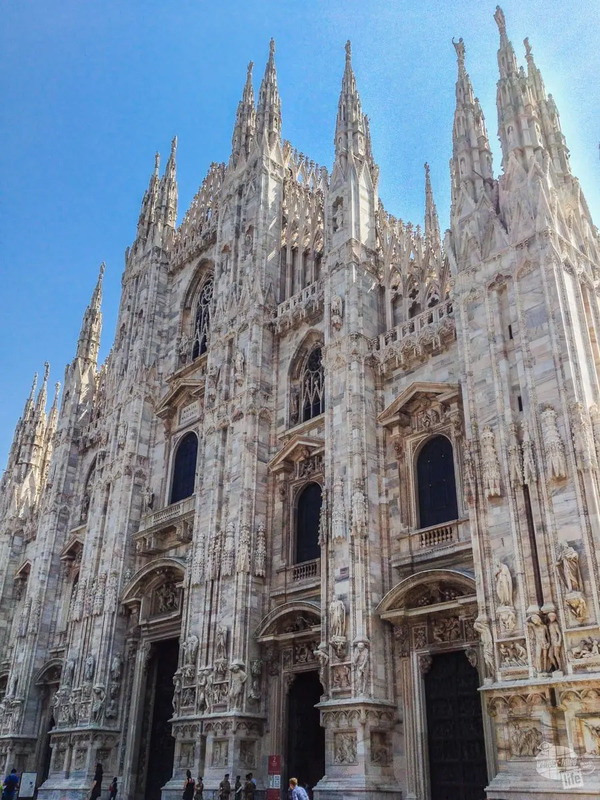 So, basically we spent the night in Milan for a 30-minute visit to one cathedral. If I had it to do over, I would skip Milan. It just wasn’t where our interests are. We stayed at the DoubleTree by Hilton, which was a nice hotel, out of the main part of town, but near a metro station. Locals obviously frequented the restaurant and bar. Thankfully, our next stop, Varenna, made up for the wasted time in Milan! 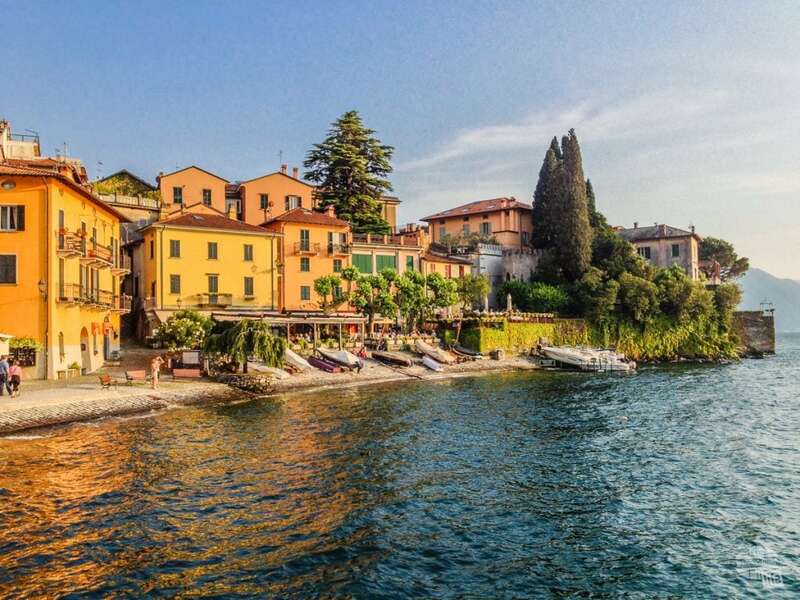 Located on Lake Como, Varenna became one of our favorite cities in Italy. We visited an old castle that is now home to several owls and hawks. They do a falconry show each day, but it was short due to the heat. The hike there was still worth it, as there were great views from the top. We also took the ferry across the river and did a short hike in one of the neighboring towns. We loved this area and would definitely spend more time here if we could get a do-over! The Hotel Montecodeno provided a comfortable room, though it did have a very small shower. The big attraction in Turin is the Museum of the Shroud. We enjoyed the museum and how it presented the information. We also visited the Cinema Museum, which was just ok.
Turin was not overly touristy or crowded, which was a nice change. 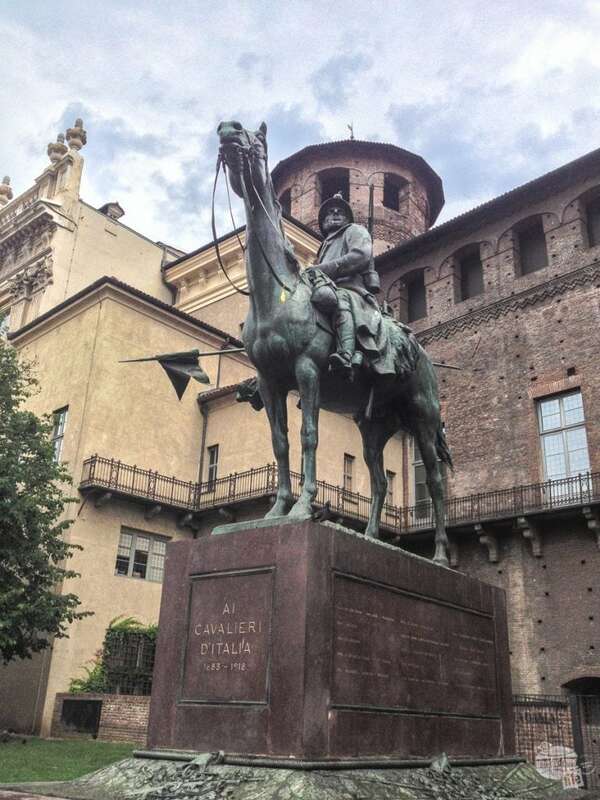 If either of these attractions interest you, or anything else you read about in Turin, then it’s worth a day. Otherwise, you could probably skip it. We stayed at the Best Quality Hotel Gran Mogol, a nice, comfortable hotel, despite the fact they were in the middle of some renovations. Read more about our time in Northern Italy here. 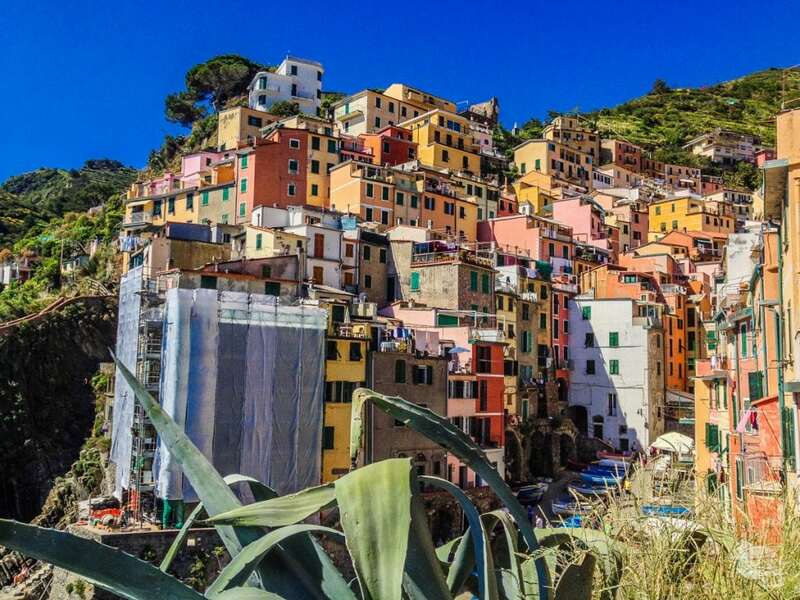 Riomaggiore is one of the five towns that make up the Cinque Terre. These towns are quintessential Italian coastal hillside towns and there is a hiking trail that connects all of them, which makes the area even more interesting. There are a couple of different trails. The Blue Path, is the lower and more popular path. The Red Path is higher up the mountain and more difficult to get to. In fact, we were not able to hike the Red Trail, as we waited too late to plan it and couldn’t make it work with the bus schedule. Parts of The Blue Trail were closed, due to poor conditions, which is not unusual after a lot of rain. There have even been some mudslides in the past that have completely washed out parts of the trail. We took a train to Monterosso al Mare, then hiked to Vernazza and on to Corniglia. Having train service to all the towns makes it easy to start and stop hiking wherever you want or need to. We stayed in Riomaggiore at the Hotel La Zorza, which provided a large one bedroom apartment above a nice bar/restaurant at a very reasonable price. 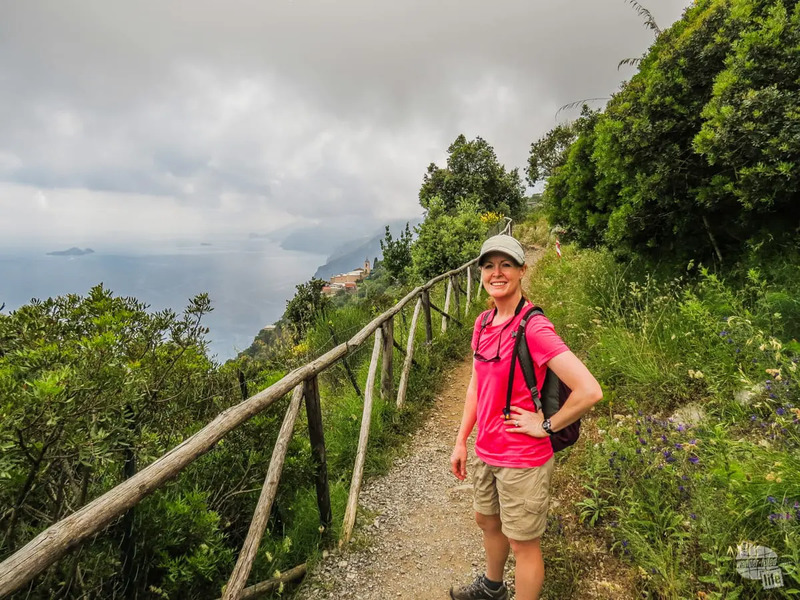 Read more about Hiking the Coast of the Cinque Terre here. We made a quick stop in Pisa on our way to Florence to see the Leaning Tower. As we walked through town, it was obvious that we really weren’t missing anything else. Thus, we did not feel bad for not spending more time there. I’m sure Pisa is a lovely town, but we had other towns that we were more interested in seeing. Florence is by far our favorite “big” city in Italy. The art and beauty of the entire town is just magical. We found what ended up being our favorite restaurant, Trattoria Antica di Tito, not far from our Bed & Breakfast. Grant REALLY enjoyed the Beef Florentine! There are tons of interesting sights in Florence, so I would suggest giving yourself at least two or three days. 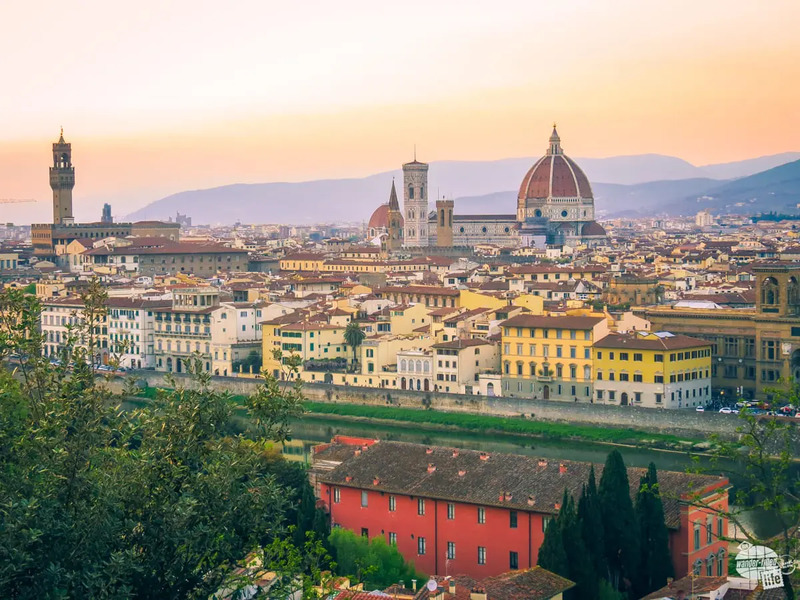 I am sure that it would be easy to fill up a week, especially if you decide to use Florence as a base to travel out to Pisa or any of the smaller towns in Tuscany. We stayed at the B&B La Notte Blu. The hotel was about a 10-minute walk from the main part of town – close enough to be convenient, but far enough to not be too loud or crowded. While one night is plenty of time to “see” Cortona, we could easily have spent several days here. It is absolutely beautiful and very quaint and interesting, as most of the small hill towns are. 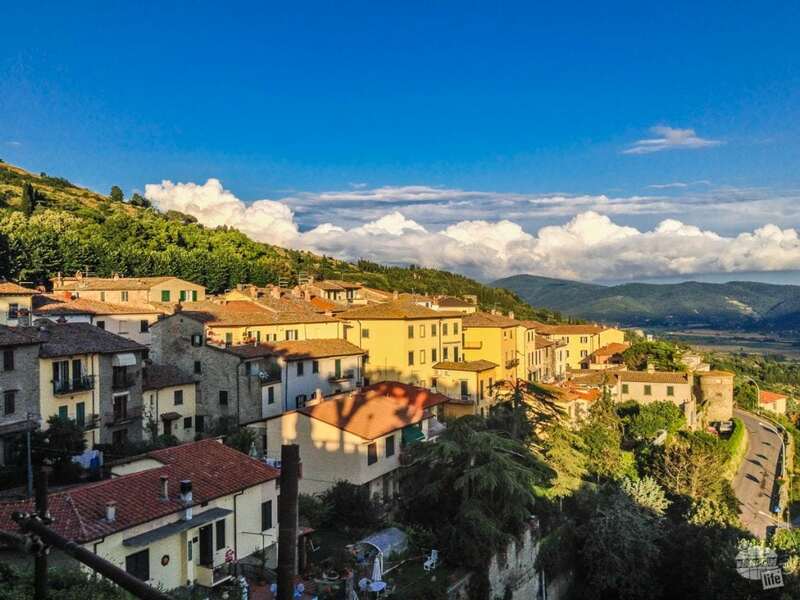 It was VERY easy to see why Frances Mayes was inspired to buy and renovate a house here, which ultimately became the book (and movie), Under the Tuscan Sun. Spend as much time here as you can. The Hotel San Luca was right at the entrance to the town with great views and a good restaurant. 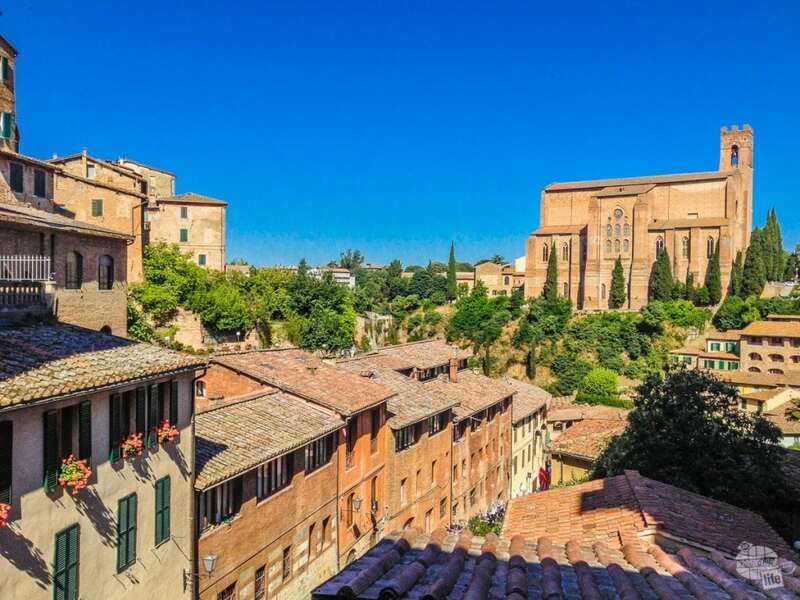 We spent “extra” time in Siena, because we were here for The Palio. 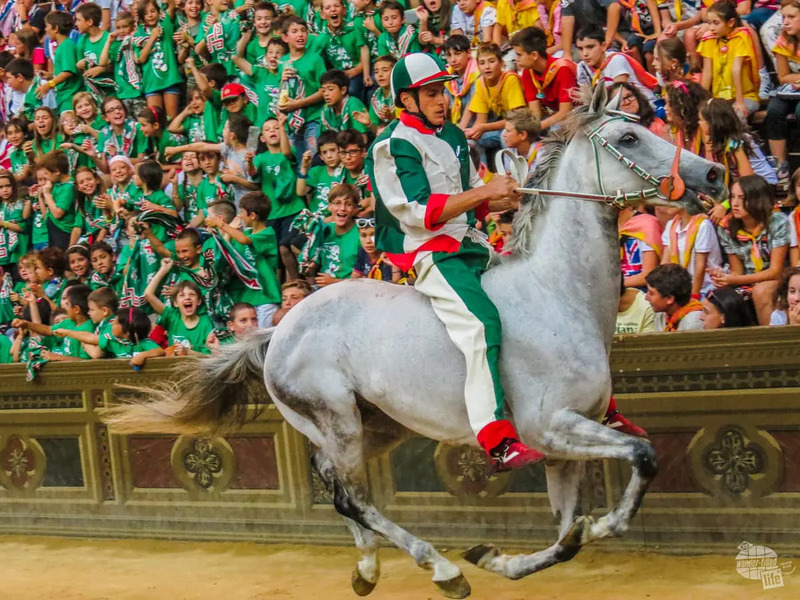 If you haven’t heard of The Palio, be sure to check out our article here. If you can time your visit so you are in town for The Palio, we highly suggest it. There are probably one or two days worth of sites any other time of the year. Siena is a smaller town, but not too small. It too would be a good town to use as a base to take day trips to some of the other small towns in Tuscany. The Hotel Albergo Chiusarelli was amazing! Great location, great food, and managed to accommodate us when we decided to add an extra night at the last-minute… Not easy to do on the day of The Palio! The winner of the Palio was Oca! I am convinced that most visitors love Assisi because it is the only small town they visit. And I understand that. If you have limited time and/or money, I understand choosing Assisi as your one small town so that you can see the church of San Francesco. Don’t get me wrong, it is an interesting town, and the church is nice. But, we enjoyed Cortona and Siena more. 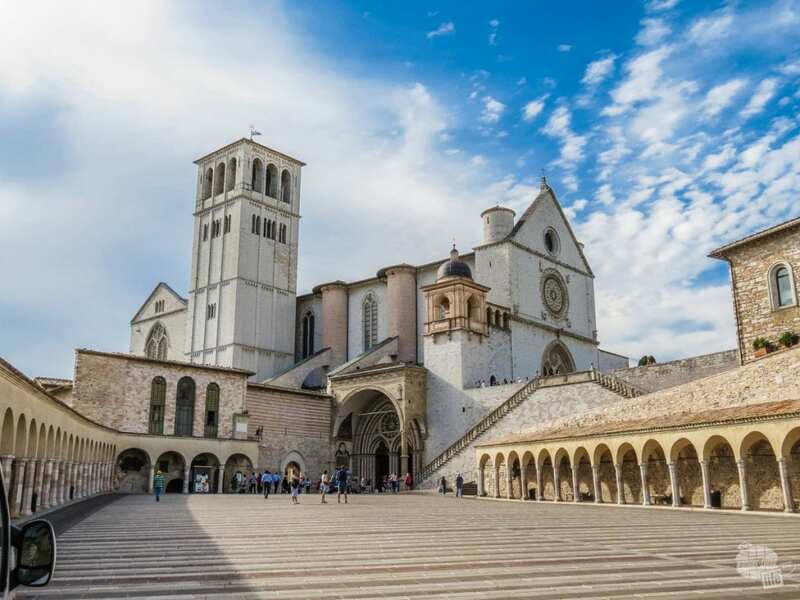 The Basilica of San Francesco d’Assisi was built to honor St. Francis immediately following his canonization. By this point in the trip it was “just another interesting church” to us. Seriously, there are SO MANY interesting and pretty churches and paintings in Italy that eventually they all run together. The Hotel Sorella Luna was very comfortable and conveniently located. Our last night in Italy was at the Hilton Garden Inn at the Rome airport. We did not see any additional sites in Rome this day. We like to stay near the airport on our final night, especially if we have an early flight. It allows us to not have to worry about fighting traffic and missing our flight and maybe even get a little extra sleep! We thoroughly enjoyed our trip to Italy, though we would certainly make changes if we were doing this trip again. Spend the one month in Italy, rather than splitting it up between two or three, or more, countries, was definitely the right decision for us. You can get more details on each of our stops in the links above or below. I know there are still some amazing sights that we missed. Hopefully, we will get to go back one day and revisit some of our favorites and enjoy some new places. In the meantime, we will stay busy visiting the hundreds of countries that we haven’t been to yet! 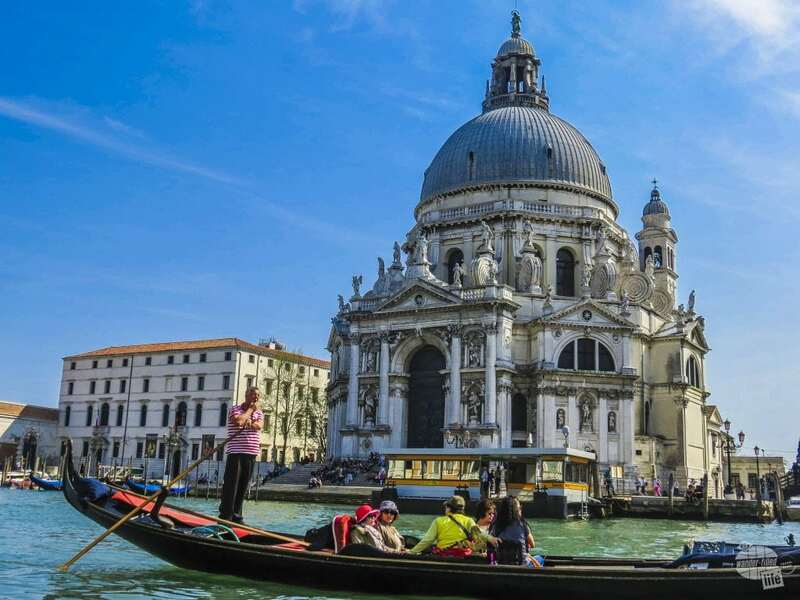 If one month in Italy is too much for you, check out our itinerary for One Week in Italy (Venice, Florence and Rome).